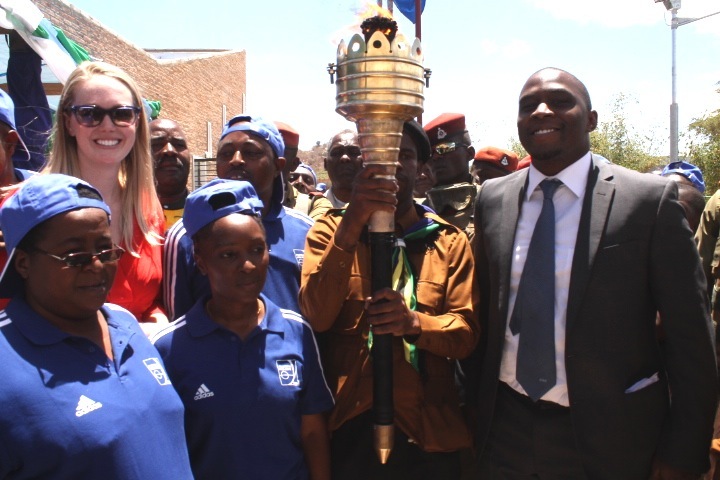 Julia Bishop (Programme Manager, streetfootballworld) (left), & Patrick Onyango (FIFA Representative) (right) along with IDYDC staff pose with the Tanzania Independence torch at the FFHC opening ceremony in Iringa, TZ. 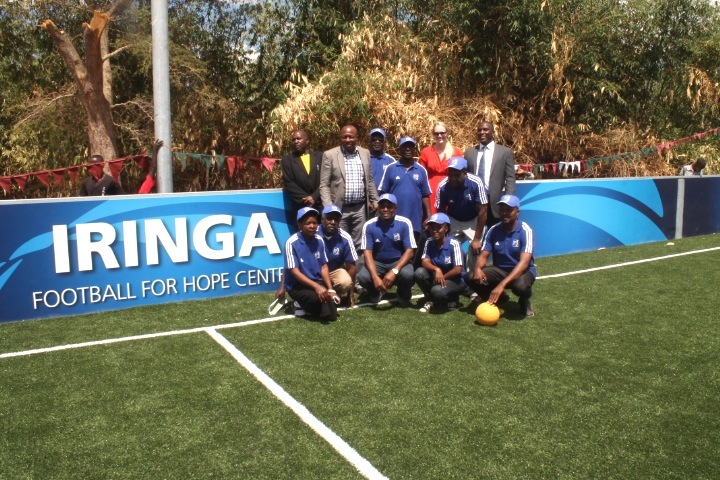 October 13th marked a milestone for one of Grassroot Soccer’s local Tanzanian partners, Iringa Development for Youth, Disabled, & Children Care (IDYDC) as they partnered with FIFA and streetfootballworld to host the opening ceremony of the Iringa Football for Hope Centre (FFHC). 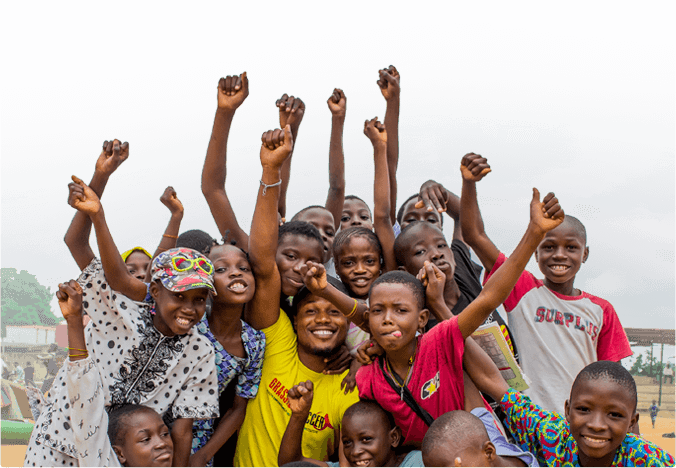 The Centre is the 14th FFHC to open as part of FIFA’s ’20 Centres for 2010’ campaign, which, in partnership with streetfootballworld, is creating 20 Football for Hope Centres to promote public health, education and football in disadvantaged communities across Africa. Iringa is located in the Tanzanian highlands, approximately 300 miles from Dar es Salaam. IDYDC will run the day-to-day operations of the Centre. Representatives from IDYDC, streetfootballworld, and FIFA celebrate the opening of the new Iringa FFHC. The opening ceremony included attendees from throughout the local community, representatives from local government, members of the Tanzanian Football Federation, and the local Member of Parliament. The event featured a visit from the Tanzanian National Freedom Torch, which is traveling around the country to celebrate 50 years of Tanzanian independence. 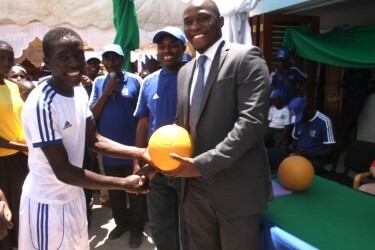 There also was a mixed-gender football match between the Upendo Center Girls & Ruaha Boys, the two winners of a tournament earlier in the week; a press conference; and special guests of honor, Julia Bishop, streetfootballworld ‘20 for 20’ programme manager, along with Patrick Onyango from FIFA. IDYDC has been a GRS partner since 2008 and has graduated 5,000+ youth from the Zinduka Kupitia Soka program (Generation SKILLZ TZ) in Iringa, Mufindi, & Dar es Salaam, Tanzania. IDYDC, through ExxonMobil support, is on target to graduate 3,000 youth from SKILLZ interventions in 2013. The new FFHC will be used to reach youth in Iringa and surrounding villages. The Center will feature SKILLZ Street TZ (girls programming) & SKILLZ Bafana TZ (boys programming) as well as malaria prevention messaging. Through the great work and dedication of IDYDC, GRS is assured that the FFHC will improve the lives of youth in Iringa and Tanzania as a whole. GRS is sending huge kilos IDYDC’s way and is proud to continue to partner with them to help the Centre reach its full potential!